I recently saw the Pasta Press or Pasta Extruder for KitchenAid Stand Mixers in the Williams and Sonoma catalogue and have been trying to decide if I need yet another kitchen gadget. After reviewing the pros and cons of each KitchenAid pasta attachment, I think unfortunately, I've decided I almost have to have both! The Pasta Press is different from the other pasta attachments for the KitchenAid mixer because it actually makes 6 different kinds of pasta dough - spaghetti noodles already formed and cut (2 sizes), macaroni noodles already formed and cut (2 sizes) and 2 other popular types of pasta - fusilli and bucatini. The ease with which this pasta attachment works is incredible - watch the video and see if you don't think you could use one of these great little machines! This is a super quick and easy waffle recipe that is light and crispy - and loaded with good-for-you walnuts. The beaten egg whites lend the lightness and crispiness to this recipe for waffles, but I decided to add in some walnuts just for fun and see how it turned out. The result was one of my best tweaks ever and have decided this is my all-time favorite waffle recipe. Try some of the other variations or serving suggestions - you can't go wrong! These are also excellent dessert or dinner waffles. There seems to be a lot of confusion about how we can legally use images, videos, charts and graphs whether we are writing on hubpages or writing blogs in general. After these questions had been bothering me for a while, I decided to look deeper into the questions and try and resolve them in my own mind. I came up with the following information and hope that you will find it helpful on how to legally use images, videos, charts and graphs on the Internet. I have had many comedic water experiences in my life, but this one has to be about the best one ever! I grew up loving the ocean in San Diego, California and lived for my times out beyond the breakers. I have to admit though growing up, I did not do any body surfing and certainly never did boogie boarding. However, when my brother-in-law Rudy challenged me to try out boogie boarding in my 30s, I could not let the dare go by without trying - much to my chagrin with the usual comedic results. Here's a great recipe for an old fashioned muffin but a healthy recipe - how to make oatmeal muffins with numerous variations. Healthy recipes start with healthy ingredients and this one is loaded with good things - such as buttermilk and oats - quick or regular. You can add blueberries or nuts - or both. You can also add chopped apples or raisins. Still further, you can add a dollop of apple or pumpkin butter to the center of these delicious little gems and have yourself a wonderfully delicious breakfast treat or an afternoon pick-me-up snack with tea or coffee. I recently found out the hard way that I had forgotten some very basic steps to teaching my malamute Griffin how to swim. On further reflection, I decided that I would go back and try it in a different and more relaxed manner to build up his confidence and thus ensure that he is comfortable as a swimmer. Here is a hub on how to best teach your dog how to swim - and the wonderful benefits of water therapy for dogs. Check out the wonderful resources as well and some of the fine products offered for fun in the water with your favorite canine! Recently, our daughter Kate, her husband Kevin and our middle son Patrick all traveled to Central Oregon for a visit. During their stay, we did many and various things and had a great time. Our last day trip was to Lake Billy Chinook last Saturday and here's how that turned out! As usual, a bit of a day with Lucille Ball and company. I am a 50-something medical transcriptionist and business owner by day, seasoned wife and mother of 35 plus years, who has devoted my "spare" time to rescuing and owning dogs. Each dog's unique past and the never-ending sagas of how that dog became a part of Audrey's life and joyous memories serve to reiterate the fact that there can always be a new lease or "leash" on life! I also go in search of recipes - if they are there, I will find them and test them so beware you cookbooks! I love cooking and find it a wonderful way to relax and forget about everything. Add to that rabid reading, gardening, music, films, etc., I lead a very full life. 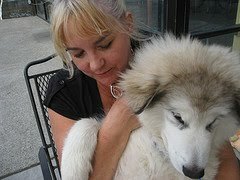 My main dog focus at the moment is malamute and their protection and understanding. Too many of them (along with many other misunderstood breeds) end up in shelters and in my humble opinion it is because people just don't understand the breed. Other interests and focuses are abuse on any level and understanding why people do the things that they do! In other words, I am a very 'narrow' person.